There are five traditional areas of study in chemistry. They include organic, inorganic, biochemistry, analytical, and physical. There are a number of Creation scientists involved in each of the different areas of study. One of the founding fathers of chemistry was creationist Robert Boyle to whom modern chemistry owes enormous gratitude for his work, writings, and research. Boyle loved God’s truth, which helped him see the grand errors of alchemical theory that were hindering the development of what is now scientific chemistry. 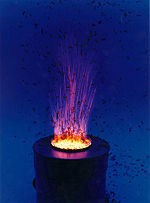 A chemical experiment where a glycine-nitrate process is used to produce ultrafine metal oxide powder. Organic chemistry is the study of the properties of the compounds of carbon that are organic. (All organic compounds contain carbon, but some carbon compounds, like carbon dioxide, are considered inorganic because they do not contain single chemical bonds between carbon and hydrogen.) Although there are specific areas of study that certain scientists choose to work in, the boundaries between the five main areas are not stable. Many times, a scientist will jump into one form of study to solve a problem in another. Many organic chemists use analytical chemistry to determine the composition of an organic chemical. Inorganic chemistry puts emphasis on the study of synthesis, structure, thermodynamics, reactivity, spectroscopy, and bonding properties of compounds. In general, it is the study of chemicals that do not contain carbon. Inorganic chemicals are found in non-living things like rocks and minerals. This field covers all chemical compounds except the organic compounds containing C-H bonds. Those are subjects of organic chemistry. Although the two areas of study are supposed to be opposite, the studies sometimes overlap. The classes of inorganic compounds are the oxides, the carbonates, the sulfates and the halides. They in general have high melting points, and are not good conductors in the solid state. Biochemistry is the study of the chemicals of living systems and their interactions. It deals with the structure and function of cellular components, such as proteins, carbohydrates, lipids, nucleic acids, and other biomolecules. Biochemistry studies the chemical properties of important biological molecules, in particular the chemistry of enzyme-catalyzed reactions. Some areas of biochemistry include the genetic code, protein synthesis, cell membrane transport, and signal transduction. A large study has been on cell metabolism and the endocrine system. They have been described in great detail. This program works closely with many analytical chemists to determine how much lead the water contains so that they can clear the lead from the water. Analytical chemistry is the area of study that leans toward gaining knowledge of the composition of different kinds of matter. Unlike other areas of study like inorganic chemistry and organic chemistry, analytical chemistry is not restricted to any particular type of chemical compound or reaction. Properties studied in analytical chemistry include molecular morphologies, distributions of species, and composition and species identity. This area of science asks a lot of questions, but the study generally ends once the questions have been answered. Analytical chemistry generally does not attempt to use chemistry or understand its basis, but it has had many outgrowths of discoveries after the "questions" were answered. A common question that a scientist in analytical chemistry would ask would be, "How much lead is in drinking water?" Physical chemistry uses physics to study macroscopic, microscopic, atomic, subatomic, and particulate phenomena in chemical systems. It traditionally uses the principles, practices and concepts of thermodynamics, quantum chemistry, statistical mechanics, and kinetics. It is the area that deals with the mechanism, the energy transfer, and the rate of matter as it is changing. For example, a physical chemist might study factors that affect breathing rates during exercise. It is the goal of physical chemists to develop an understanding at the molecular and atomic level of how chemical reactions occur and materials behave. This kind of knowledge is essential to all areas of chemistry. After being asked how to describe what physical chemistry is like, Gilbert Newton Lewis, a well-known scientist said, "Physical chemistry is everything that is interesting!" Nuclear chemistry is a sub-field of chemistry dealing with radioactivity, nuclear processes and nuclear properties. Of particular interest are the process involved with the splitting and combining of atoms to make new substances and energy. Before major study was done in biochemistry, it was generally believed that life did not follow the laws of science the way non-living things did. It was thought that only living beings could produce living molecules, but that thought changed in 1828 when a German chemist named Friedrich Wöhler (1810-1882) published a paper on the synthesis of urea. 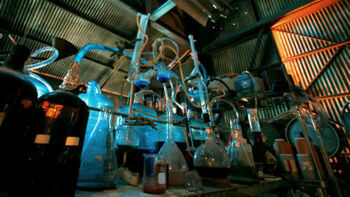 It proved that organic compounds could be created artificially. Urea synthesis was very important for biochemistry because it showed that a compound known to be produced only by biological organisms could be produced in a laboratory, under controlled conditions, from matter that wasn't alive. He was originally studying organic chemistry, but his pioneering greatly impacted the study of biochemistry. He made a vacuum pump that he used to prove that air was important to transmit sound. He changed the way the modern world thought about chemical elements (that they are the smallest part of a substance that cannot be separated into simpler substances). He created the scientific method. He helped others understand the difference between compounds and mixtures. While the laws of physics and chemistry are certainly in effect for supporting life processes, a closer examination reveals that chemistry cannot be the path through which life arrived on Earth. This has daunted scientists for centuries, who are now prone to "punt" to the stars and claim that life "arrived" on Earth from elsewhere. A simple review of the coordinated activity among the chemical reactions necessary to support life, and a running theme develops: waste products. The biochemical activities actually create more waste products than useful ones, and the living organism's ability to eliminate waste is a key factor in maintaining health. The famous Miller-Urey experiment highlights the need to separate the useful products from the environment that created them. This experiment is a classic form of tautology in that the scientists actually imposed artificial conditions that would never have been available to early life. The bottom line is that chemistry is not the pathway to life, but the enemy of life. The living processes are what keep the chemical reactions under control. In fact, when an organism dies, it is because it is because chemistry has won. After all, when an organism dies, all of the necessary chemicals are in place to maintain life. Why can we not jump-start the living process again? Life can be considered a property of organization, not just a collection of chemical reactions. The instructions in the DNA tell the living processes what to do and when to do it, and contain the instructions for the parts that are both initially and ultimately responsible for eliminating waste. This clear dichotomy of roles (chemistry as the pathway to life and chemistry as the enemy of life) is a major reason why many chemists and biologists have given up on abiogenesis and now look to the stars for answers. Avogadro's Law: Equal volumes of gases at the same temperature and pressure contain the same number of molecules regardless of their chemical nature and physical properties. Boyle's Law (Robert Boyle): In a gas, the product of pressure and volume remains constant. Charles's Law: In gases, volume and temperature are directly proportional. Thus, for two cases, V1 / T1 = V2 / T2, where V1 and T1 are the initial volume and temperature of the gas, and V2 and T2 are the final volume and temperature of the gas. Dulong-Petit Law: The gram-atomic heat capacity (specific heat times atomic weight) of an element is a constant. There are exceptions to this law, and it is not exact. Fick's Law of Diffusion: The net diffusion rate of a gas across a fluid membrane is proportional to the difference in partial pressure, proportional to the area of the membrane and inversely proportional to the thickness of the membrane. Fourier's Law: Heat flow through a homogeneous solid is directly proportional to the area, A, of the section at right angles to the direction of heat flow, and to the temperature difference along the path of heat flow. Graham's Law: The rate at which gases diffuse is inversely proportional to the square root of their densities. Henry's Law: The mass of a gas which will dissolve into a solution is directly proportional to the partial pressure of that gas above the solution. Ideal Gas Law: PV = nRT where n = number of moles, R = universal gas constant = 8.3145 J/mol K; T = temperature. ↑ Brady, James E.; Holum, John R (1996). Chemistry: The Study of Matter and its Changes (2nd ed.). New York: John Wiley & Sons. p. 2. ISBN 0-471-10042-0. ↑ Eisenberg, Robert, ed. Inorganic Chemistry Home Page. ACS Publications, American Chemical Society, n.d. Accessed August 20, 2008. ↑ "Physical Chemists Explore The Way Things Work." American Chemical Society, 2008. Accessed August 20, 2008. This page was last modified on 14 August 2015, at 21:22.